Did you know that November is World Vegan Month? And today, 1st November, is International Vegan Day? 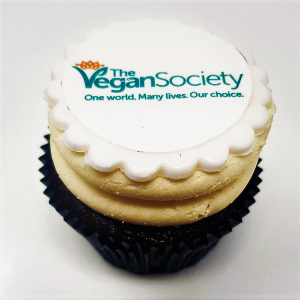 To mark this special month, we’ve partnered with The Vegan Society to create a specially designed cupcake that will be in store throughout the whole month. The Vegan Society is the world’s oldest vegan organisation. Their founder Donald Watson coined the term ‘vegan’ in 1944! The Vegan Society are an educational charity that provides information and guidance on various aspects of veganism. Their vision and mission is a world in which no animal is exploited for the benefit of humans, and all of their work focuses on inspiring people to become and stay vegan. They provide support for new and existing vegans, caterers, healthcare professionals, educators and the media. They also teach people about the benefits of veganism and are working to ensure vegans have the same rights as others within the public sector. This World Vegan Day, to celebrate their birthday on 1st November, they are launching a brand new mobile app, VeGuide. This is free to download for anyone interested in veganism and will introduce you to the vegan lifestyle and all the exciting aspects of it through a combination of interactive videos, recipes and information. This is available to download from app stores as of 1st November 2018. We are so excited to be working with The Vegan Society and celebrating their birthday month with these cupcakes! They will be available in store throughout November and £1 from each sale will go directly to the charity to support all the wonderful work they do. This entry was posted on Thursday, November 1st, 2018 at 12:31 pm and is filed under Cupcake News. You can follow any responses to this entry through the RSS 2.0 feed. Both comments and pings are currently closed.